Any time there is a threat to your properties, you want to safeguard them as well as you can to protect your belongings, loved ones, and investment. 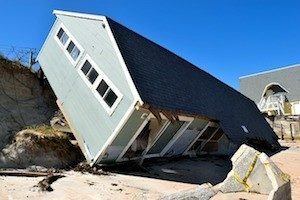 It is one thing to prepare a property that you rent to tenants, but it is quite another to prepare for a natural disaster, especially if tenants have disabilities or special needs. Fortunately, there are a few things you can do in the event of emergency weather for any property you own. In the event of a natural disaster, it is critical to take precautions such as creating a personal emergency network. This network should include family, friends, neighbors, and coworkers who can help you when disaster strikes. The list should include at least three people for each place in which you regularly spend time, including your home, work, vacation home, or investment property. This way, you’ll have plenty of people who will check on you when emergency weather conditions arise and make sure that you are safe. Make sure that you have alternate ways to contact people because phone service may be limited. If you rent a property, make sure your tenants have such an emergency network in place, too. You should be on their emergency contact lists, and you should ensure tenants have a way of communicating with one another about their wellbeing. For example, encourage them to knock on each other’s walls or hang a piece of cloth outside their window to signal that they are safe. As the property owner, you also should entrust another set of keys and security codes for the property with someone on site in case you cannot get there when disaster strikes. Property owners have a responsibility to their tenants to keep up with maintenance, just as homeowners complete regular maintenance to keep their homes in good repair and their home systems running. In addition to regular maintenance, there are some tasks you should complete to safeguard your properties from weather’s harshest elements. For example, you should remove dead trees or branches from your property that could blow into or on top of buildings, cars, or people. This will help protect your property and the people who live there from strong winds. Similarly, you should trim brush to create a buffer zone of at least 30 feet around buildings to help prevent flames from reaching residences during wildfires. And, if you live in a place that is subject to hurricanes, have shutters or plywood cut to fit windows and glass doors ahead of time to board up your property quickly when a natural disaster looms. If you live in an area prone to tornadoes, you should have a reinforced safe room or underground shelter stocked with a basic disaster supplies kit. The Federal Emergency Management Agency (FEMA) recommends a kit containing one gallon of water per person per day for at least three days, at least a three-day supply of non-perishable food, a battery-powered radio and a weather radio, a flashlight with extra batteries, a basic first aid kit, a whistle for signaling for help, personal sanitation items such as hand sanitizer and moist towelettes, plastic sheeting and duct tape to shelter-in-place, a manual can opener, blankets or sleeping bags, changes of clothes that protect against rain and cold, and identification. You also should have extra medication, medical supplies, and medical equipment as needed. If you rent your property, talk with your tenants about the shelter and ensure they have kits prepared for themselves. Remind anyone with a service animal to have basic supplies for the animal in the kit as well. Make sure to review the emergency plan for entering the shelter with tenants and that they know what to do if you are not on site during the natural disaster. No matter which type of property you own, you should take steps to protect it in the event of natural disasters. If you do have a rental property, make special considerations for tenants with disabilities and make sure there are extra safeguards in place, such as a personal emergency network including your contact information and extra basic disaster supply kits in shelters, to help everyone stay safe when disaster strikes.